(Phys.org) -- Researchers working for the Herpetological Foundation of Sri Lanka have obtained a specimen of the Kandyan dwarf toad (Adenomus kandianus) near a stream in a sanctuary in the island nation of Sri Lanka. Prior to its find the toad had been thought to be extinct as no reports of its existence had been published since its initial description in 1872 with further details added in 1876. The researchers describe their find in a paper published in the journal Zootaxa. The team came upon the toad by accident, believing it to be a torrent when it was captured on a night expedition. 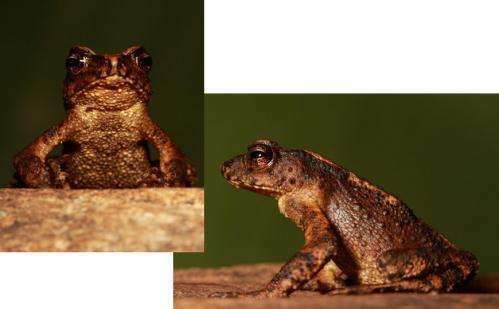 The two species closely resemble one another and the team believes its likely that the group of toads from which the Kandyan was taken were likely a mix of both. The Kandyan can be distinguished from the torrent by its froglike webbed feet and dark warts on its back. Prior to the discovery the Kandyan had been listed on the IUCN Red List of Threatened Species as extinct, primarily because it had not been seen in over a hundred years. The research team believes its status will be changed to Critically Endangered once updated on the list due to the threats to its environment by logging. The found specimen was definitively identified by comparing it with two specimens held in British museums since the 1800s. The team was in the area to perform a survey on indigenous amphibians because they say not much is known about the diversity of the populations there. The region is remote, the weather generally bad and the terrain difficult to cross, and as a result few researchers have ventured into the area to find out what sorts of animal life exists there. The Kandyan sample was in fact found back in 2009, but its existence has only come to light now due to the team publishing their paper. Sri Lanka has the highest proportion of amphibians listed as extinct by any nation with some sixty percent of those recorded at one time or another as gone forever. The research team who found the Kandyan dwarf toad suggest that more surveys in the remotest parts of the island would likely prove some of those other listings to be incorrect as well. Adenomus kandianus Günther (1872) was previously known only from two specimens both deposited in the British Museum, the holotype BMNH1947.2.20.63, and the syntype of A. kelaarti BMNH1947.2.20.62. The only record of A. kandianus since the initial description in 1872 was by Ferguson in 1876, who mentions two specimens resembling Bufo kandianus in his collection, making A. kandianus the worlds rarest toad. The species had not been reported since, and was considered extinct. Here we report on its rediscovery.